Betty and I discovered Ipomopsis ramosa in 2006 in the Roaring Fork Canyon, a side canyon of the Dolores River Canyon, about 40 miles northeast of our home. 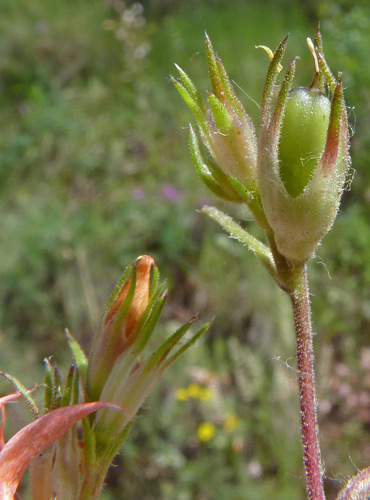 We had driven the scenic road along the Roaring Fork canyon wall many times on our way to hiking the Colorado Trail, but we had never noticed the plant until it caught my eye in June of 2006. Delighted to find such a lovely plant, we quickly abandoned our plans to hike the Colorado Trail that day so we could identify the plant and search for more of them. We were quite successful at the latter, finding many dozen plants, but no matter how many times we attempted to identify the plant using Colorado Flora: Western Slope, we could only be certain that it was a Phlox, almost certainly in the genus Ipomopsis. Beyond that, we were stumped. At home that night we worked our way through several other floras with no more success in identifying the plant. We still, however, had no thoughts about a new species; we simply believed that we were making mistakes in trying to key the plant. The only step left was to send specimens to several prominent botanists; they were kind enough to reply promptly and indicated that the plant was just a form of an already known species, the common Scarlet Gilia, Ipomopsis aggregata. Over the next years, Betty and I observed the plant many times, surveyed the extent of its population along the road, compared it with the normal form of Ipomopsis aggregata, and wondered again and again if our plant really was an already described species. In the spring of 2011 I decided to settle the question by doing a very thorough analysis of all the major and minute characteristics of the plant. Dissecting many flowers and entire plants and examining and comparing the most minute details with known species convinced me that our plant was not Ipomopsis aggregata, and that it was a new species. I shared my findings with professional botanist Guy Nesom and we concluded that we should proceed with the description and publish the new species. After several months of work on the description, I sent the details to the top two experts in Polemoniaceae and they agreed that we had a new species. Click to read the new species description (1 1/2 meg). 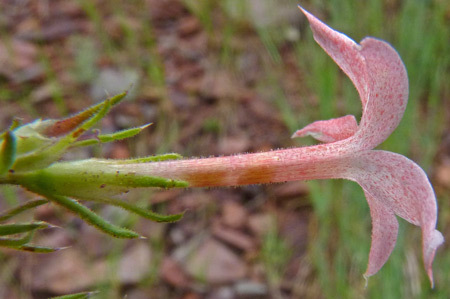 And click again to read the 2014 research (published in 2017), "Pollination ecology of the newly described narrow endemic Ipomopsis ramosa (Polemoniaceae) in southwestern Colorado", research done by Professor Ross McCauley and several of his students at Fort Lewis College in Durango. 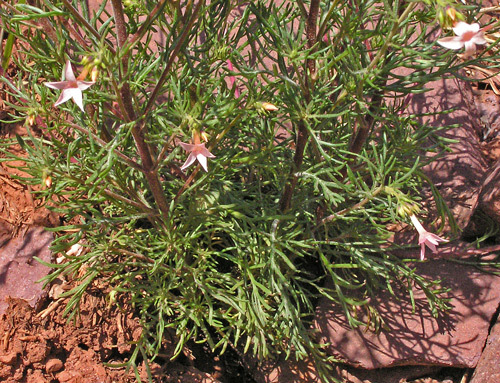 I considered a number of specific epithets that reflected various unique characteristics of this new species ("brevistylus", "breviflora", "aurantiaca") but because the shape of the plant is so immediately distinctive, I gave the new species the specific epithet of "ramosa", Latin for "many branched". Five years may seem a long time between finding and publishing a new species, but in botany, that is about par. It is actually not uncommon for new descriptions to lag decades behind their discovery. 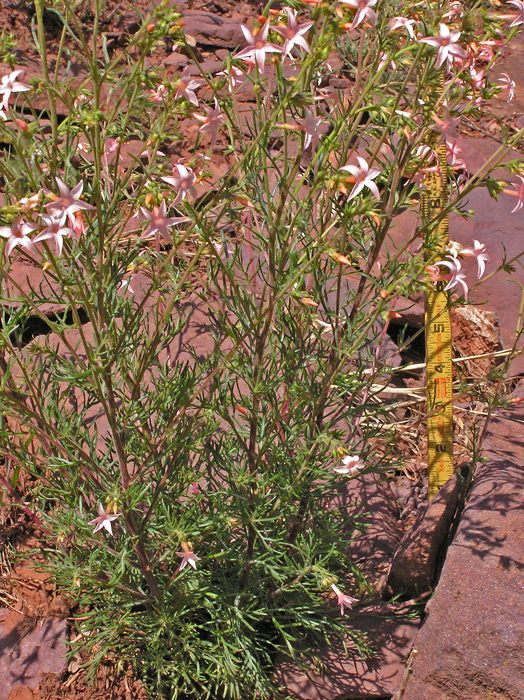 Occasionally descriptions are published very quickly: Three years ago Peggy Lyon and I discovered Gutierrezia elegans and had it published as a new species just three months after we discovered it. That was a remarkably short time. Betty and I discovered our second species, Packera mancosana, in 2008 and published it in June of 2011. The Ipomopsis genus was named by Andre Michaux in 1803. 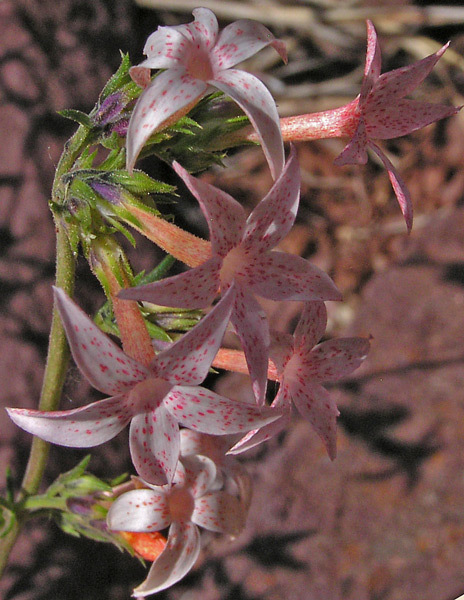 20th century Gilia experts, Verne Grant and Alva Day, re-assigned many plants in the genus Gilia, another genus in Polemoniaceae (Phlox Family), to the Ipomopsis genus in 1956. The Ipomopsis genus is characterized by plants with leaves that are entire to deeply pinnately lobed; flowers that are salverform (tubular and flared dramatically at the tip); flowers colored white to purplish, red, or pink; flowers terminal, paniculate (branched racemose form), pedicelled, actinomorphic (radially symmetrical), and subtended by a single bract; stamens that are unequally inserted on the corolla tube or throat; filaments that are equal or unequal in length; anthers that are included to exserted; and a style that is included to exserted. (Adapted from Wilkens and Porter, Canotia, 29 Nov 2005-vol 1). "Ipomopsis" means "similar to Ipomoea" ("Morning Glories", one of which has a tubular red flower which must have reminded Michaux of an Ipomopsis flower). Montane. Woodlands, meadows, openings. Summer, fall. Roaring Fork Road, June 29, 2006. This is a beautiful new species of Ipomopsis found in just a few side canyons of the upper Dolores River in southwest Colorado. In these canyons it ranges from abundant along the Roaring Fork to rare elsewhere and from about 8,200-9,300 feet in elevation, always on the Cutler Formation, red sandstone. The floral tubes are quite short, only 15 millimeters. The style is only 2-4 millimeters. The plants branch frequently from the base and along the main stem producing a bushy growth pattern. The flower color is a mix of coral-pink, orange, and white. The glandular hairs impart a very strong and pleasant aroma. Ipomopsis ramosa basal rosettes are withered at flowering, plants are densely covered in glandular hairs and sparse silky hairs, leaves are light green, and plants are 12-18 inches tall. Plant height, flower dimensions, flower color, etc. are quite uniform from plant to plant. There are, of course, variations: lighter-colored corollas, some albinos, less branching (especially in drought years), etc. Click for more photographs of Ipomopsis ramosa. Leaves are deeply divided and stems are often multiple and many-branched. The five anthers and one style are buried deep in the floral tube. The five varying length filaments and the anthers extend about half way up the floral tube and the style is only 2-4 millimeters so none of the sexual parts are visible in this photograph. 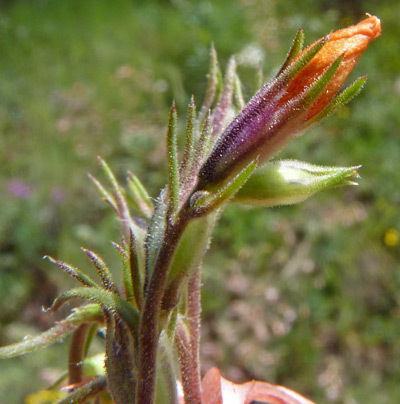 Notice the hairiness on the outside of the floral tube as well as on the multi-colored calyx. The flora tube is heavily streaked coral-pink, the inside of the lobes is lightly dotted coral-pink, and the back of the lobes is streaked coral-pink. Flower lobes are reflexed. Although the flowers are actually coral-pink, they often appear to be orange or salmon -- even when you see them in person. Roaring Fork Road, July 19, 2011. The floral tube is just 14-17 millimeters long and about 1 millimeter wide at the base in the calyx and 2 mm at the orifice just at the base of the lobes. Notice that in the middle of the tube, you can see two slightly separated darker areas. The tube is so translucent that you are looking at the anther sacs inside the tube. These sacs give the tube an orange tint. On the right side of the photograph, the corolla has fallen from the calyx and the green seed-bearing capsule and bent-over straw-colored style now show. The capsule will swell 1-2 millimeters more (it is about 3 millimeters in this photograph) and then it will dry and split, spilling its seeds. Notice the hairiness of the entire plant. The short glandular hairs give the plant a very spicy fragrance. Click for more photographs of this lovely new species. Click to read the complete description of Ipomopsis ramosa published September 14, 2011..